Google Search Console (previously Google Webmaster Tools) is another free web service by Google that helps you to learn about your website and the people who use it. It shows you how many people are visiting your website, the queries they type into Google to find it, and which pages are the most popular in the search engine results pages (SERPs). It also allows you to check your website’s indexing status and search engine visibility. Submit and check a sitemap to get a website indexed. See what keyword searches on Google led to the site being listed in the SERPs, as well as the impressions, clicks, click through rate and position of each keyword. Highlight to Google Search elements of structured data which are used to enrich search hit entries (Google Data Highlighter). Create a Google Search Console account and log in. Click the ‘Add a Property’ button. The next step is to verify that you own the website. 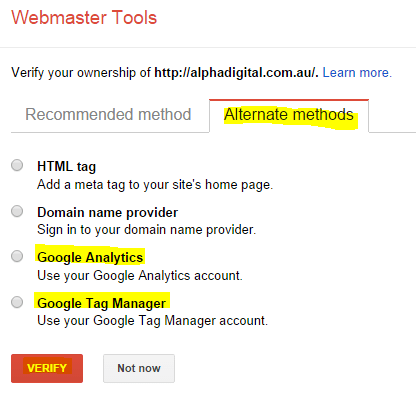 If you’re using the same account that Google Analytics is set up on (and Tag Manager is not able to be used), select this option and select verify. 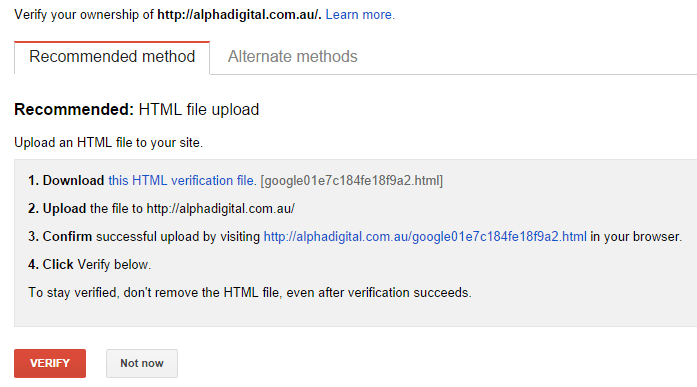 Once the site has been verified, ensure to add your client to your search console account. To do this, click the ‘Settings’ drop down in the top right of the screen and select ‘Users & Property Owners’. Add the client as a new user with ‘full’ permission and you’re done! To learn more about how to use Google Search Console, visit learn.alphadigital.com.au and sign up for free training material.